The sound of the future? Despite what headphone makers would have you believe, major leaps forward have been few and far between. We’re talking tweaks, new materials, advanced tuning. Actual innovations that truly push the envelope don’t come along all that often, which is why we were so excited to receive the Nuraphone: a pair of cans that want to personalize how you hear your music. In this review, we break down the Nuraphone’s sound, design, comfort and fit, packaging and accessories, specs and more of the Nuraphone. For alternative options, check out our list of the best wireless headphones. Here, very briefly, is the story of the Nuraphone - and it's always Nuraphone, not Nuraphones or even the Nura Nuraphone. We aren’t sure why, but whatever. Perhaps it’s because the company is technically called Nura Operations, and the Nura Operations Nura just sounds weird. In any case, the Nuraphone is a Kickstarter product (although it is now widely available to buy) and its Australian team of engineers wanted, more than anything else, to make the ultimate pair of headphones: a set of cans that didn’t just passively play music, but which would change dynamically based on whoever was listening to them. They wanted to create wireless headphones that worked effortlessly, that slotted right into your life, and that delivered universally excellent sound matched with the latest design. These are heady and ambitious goals, but if there’s one thing we can respect around these parts, it’s companies aiming for the stars. Here’s how it works. You put the headphones on, and connect them via Bluetooth to your phone or tablet – a process that is the work of moments. Then you download the dedicated Nura app (available on both iOS/Android). The app, by the way, is just gorgeous: simple to use, easy to understand, and stripped of all non-essential functions. It’s an absolute masterclass in user experience, and beats the pants off most wireless headphones. Once you begin the setup process, the headphones start addressing you in a very clear and slightly posh female American accent - as if Siri had taken elocution lessons. First, they direct you to make sure that you have a good seal of the headphones against your head, helped along by visual aid in the app, where the headphone cups get darker the better the sealers. Once that’s done, posh Siri asks you to sit quietly for a minute while she plays some tones into your ear. And as you hear the bleeps and bloops, a blob of colour begins to form on the app display. This is your own personalized hearing imprint, which corresponds to how you respond to different frequencies. The low frequencies start at 12 o’clock, and run clockwise all the way up to the highs. The bigger the bulge at any given point, the more sensitive you are to those frequencies. It is, essentially, one big EQ preset. (You don’t have to have the app open all the time - the data is stored in the headphones themselves). This kind of personalization isn’t a new idea – it was done quite effectively in the AKG N90Qs. But those were a big, clunky pair of headphones that came with a battery pack and cost $1,500 (to the Nuraphone’s $400) and we guarantee you they didn’t do this personalization process nearly as well as Nura. The process is flat-out fun, and it’s clear there’s been a huge amount of thought channelled into it. Compare this to something like the disastrous Beyerdynamic Aventho Wireless (full review here) and it’s just light years ahead. The Beyers had a five-minute setup process that was dull and dreary, and wasn’t even worth it, as far as the effect went. As for how the Nuraphone sounds when the calibration has finished…well, that’s kind of tricky. They sound, to our ears, terrific – but they would, given that these are our ears, and the headphones are presumably compensating for the ripples and whorls of our ear canals. It’s a little hard to describe just how they will sound, because obviously this will differ from person to person. However, what we can say is that while we were impressed with the overall result, which combined rich bass and clear detail, we couldn’t help feeling there was just a touch of smoke and mirrors going on. Here’s what we mean. When you first set up a personalized profile, the app begins playing a stock song in Generic mode – in other words, without profile applied – then invites you to swap back-and-forth. There’s no denying that the profile sounds amazing, but the problem is, the Generic setting sounds horrible. It quite literally sounds as if the headphones are deliberately masking the audio, designed to steer you towards and give you a better impression of the personalization. At first, we thought this was just cognitive bias – that it sounded terrible because our particular setting was just really, really good. But when we compared it to much cheaper, much smaller headphones – in our case, the $50 Optoma NuForce Be2 buds (full review here) - the Optomas just crushed it. They weren’t even in the same league. The $50 buds easily beat the $400 unaltered Nuras, even if the personalized sound signature of the latter delivered one hell of a return punch. We don’t do scientific testing here. It requires specialised equipment, and we don’t think it’s useful to the majority of readers. But if we did, this is one spot it might have been handy We can’t give a definitive picture of what’s going on here, and we certainly don’t intend to suggest that Nura are deliberately masking the sound. But there’s no denying that it was…weird. Again, we need to emphasise that we thought the Nuraphone, once personalized, did a great job, but it felt like they were hiding something from us. There were other strange elements, too. You have the option, in the app, to turn on Immersion Mode, which provides vibrating feedback with the low notes to, the company says, mimic the feeling of being in the front row of the concert. That’s some serious marketing BS, because it feels nothing like that: it just feels like increased, boomy bass that happens to be vibrating the side of your head. That’s not to say the effect isn’t pleasurable, just a little strange – and again, it feels like the headphones are compensating for something. Nura, you guys are cool, but your headphones are never going to mimic the pounding sound pressure, sticky floors, stickier bodies and pumping energy of a live show. Please stop trying. If we wanted bass, we’d get a subwoofer. And one final bit of strangeness. You can’t give us multiple profile options without having us create multiple profiles for ourselves, and each time, the app returned different results. Not just slightly different: markedly different. You can see two of the results in the screenshots below. Again, this isn’t to say that the result was bad – all of the profiles the app churned out were good, in their own way. But we just couldn’t shake the feeling that this was untested technology, and that the team at Nura were a little too enthused with it to register that it had a few issues. You can read more about the details of the technology here. From the moment we held them in our hands, there was a sense that these weren’t just your ordinary headphones. For starters, they do something we’ll admit we’ve never seen before: combine over- and in-ear design. The circular cups slot over the ears, in a familiar fashion, but inside each one, carefully angled, is a earbud, designed to be slotted into the ear. To say that it’s an unusual design would be selling it short: it’s unheard of, and it sends a very clear message that these headphones are going to do things very differently indeed. Normally, we’d include a comparison here...but there isn’t one. We’ve never seen this done before. The inner cups were made of smooth, flexible silicon, which felt good in the hands. However, because the silicon is black, it does tend to show off dust and dandruff (ick) – not a dealbreaker, but annoying, nonetheless. However, the design and build of the rest of the headphones was absolutely flawless: tough metal housing, a flexible metal band, discrete logos, and an overall sense that these were really built to last. Charging is handled through a recessed port on the right cup, and the company includes an additional connection for when you don’t want to use the built-in battery. And the battery life, it must be said, was excellent. We got up to around 18 hours at a moderate volume before the headphones required recharging, which is very close to the advertised 20 hours. All in all, these lived up to the expectations of what a $400 pair of cans should look like, and how they should perform. That’s about the same as the Bowers & Wilkins PX headphones, which are some of the best wireless cans around. Given how much extra tech the Nuraphone packs in, that’s quite something - especially given that they are identically-priced, at the aforementioned $400. We do, however, want to talk about the controls. They are, like so many other aspects of these cans, very different. They take the form of two touch-sensitive buttons on the outer housing, the functions of which can be customised using the app. The buttons respond to the touch of a bare finger (they didn’t work while wearing gloves) and although we liked how easy it was to customise them, they were way too sensitive. The slightest touch on any part of them activated the function we chose, meaning that we’d be skipping tracks while simply trying to adjust the headband. We love the idea of touch controls, but we don’t see why a simple button mechanism wouldn’t have worked here. It’s as if the team behind Nura were too in love with the technology and the potential to actually think about how these things might be used in real life. Compare that to the old Parrot Zik3 (full review here) which had near-perfect touch controls - and that was two years ago! What we did like was how the headphones responded when we took them off. Hanging them around our neck automatically power them down, and inserting the tips again powered them back up, reconnected Bluetooth, and welcomed us by name, all in a matter of seconds. This is a feature that works incredibly well, and one which we wish more headphone makers would use. The company offers a generous warranty, with a thirty-day money-back trial followed by a full year against manufacturing defects. We also want to single out the Nura team themselves for their communication, not just throughout a Kickstarter campaign where they religiously kept their backers informed, but also for individual shipping communication. That’s a big part of offering a product like this, and it’s great to see that they knocked it out the park. Unfortunately, this is one area where they didn’t knock it out park. The over-ear fit is no problem, with the squashy silicon cups easily slotting over the ears. The issue comes with the internal in-ear mechanism, which you are required to slot into your ear canal. Put simply: it’s not very good. While the angle is entirely flexible, thanks to the bud’s positioning on a silicon stem, it never feels quite as natural or as isolated as a dedicated pair of earbuds. And there’s a much bigger issue at hand, which is that it’s actually quite difficult to wear the headphones for a long period of time. Unlike many other over-ear headphones, which often vanish into the background (shout out to the Beyerdynamic Amiron Home - full review here - which remain the most comfortable pair of headphones we’ve ever tested) you are always aware of these, always adjusting them slightly, always trying to get a better fit for the buds. It’s not a massive problem – it certainly didn’t stop us wearing the headphones – but we’re not sure we’d choose these for a long train journey. By now, you’ve probably noticed a theme developing, one we’re going to keep coming back to. Everything about this product feels like a first attempt; doubtless, it’s been subject to a hundred prototypes and usability tests, but the finished product we hold our hands still feels like it has a way to go, with issues that haven’t quite been fixed. Fortunately, there’s at least one element of things where the headphones absolutely smoke any and all competition: the accessories. Up until we got these, the holder of the best headphone case of all time was the leather box that the AudioQuest NightHawk Carbons (full review) came in. We are pleased to report – or displeased, because we like the NightHawks – that they are no longer the record holder. The travel case for the Nura headphones is, in a word, brilliant. It has no zips. None at all. To open the hardshell case, you grab the magnetic tab, flipping it open to dangle where it is held by the weighted metal in the tab, grab the little fabric handle, and open it up. Inside, the headphones are nestled around a magnetized silicon case which holds the included USB-C charging cable and wired listening cable. The case has a slot in it, and it means you never have to worry about your wires bouncing around inside. Closing the case is a simple as snapping it shut, and casually flipping the metal tab back, where it locks into place without ever needing adjusting. We don’t want to harp on about this – it’s just a case, after all. Except, you know what? We’re going to. We value user experience tremendously here at the site, and this is a class-A example of it. Whoever came up with this case is a goddamn design genius. The packaging is nice, too – recycled cardboard that looks like a tortoiseshell. It’s great to see manufacturers paying attention to things like recycling, and the lack of plastic here was very reassuring. So in terms of accessories and packaging, this gets a big double-thumbs-up from us. The Nuraphone offers an ambitious and creative concept that we haven’t seen done this effectively before. The build quality and overall design is excellent, and they look and feel great. The Nuraphone has excellent sound quality, once tuned - a process that is surprisingly fun. ​They have the best case of any headphones we’ve ever tested. It’s genius. There are some real quirks with the personalization, and with the technology generally. Wearing the Nuraphone for long periods is very difficult. ​You can’t use third-party eartips on these headphones, which is odd given they allow the creation of multiple profiles. Alternatives to the Nuraphone are, as you’d imagine, quite thin on the ground, but the most obvious is the AKG N90Q. And it’s absolutely bonkers. It costs as much as 3.5 Nuraphone, comes with a battery pack, has noise cancelling tech, and sound personalisation that could best be described as interesting. All the same, it’s a fun and rewarding pair of headphones, although only for the absolutely insane. $1,500? Versus the $400 Nuraphone? Get outta here. Then there’s the Beyerdynamic Aventho Wireless. The only reason we offer these as an alternative is because sound personalization options are so thin on the ground - honestly, just buy the EVEN headphones, below. They are decent Bluetooth headphones, that do a couple of things that make us want to throw them into traffic. The app is awful, the personalization process is a giant meh, and the touch controls are hideous. They are also $49 more expensive than the $400 Nuraphone. Avoid, avoid, avoid. An excellent, if slightly less ambitious, pair of wireless headphones, are the EVEN Earprint H2 Wireless. EVEN’s H2s adapt to your own personal hearing specifications in the same way as the Nuraphone, and while the sound isn’t quite as good, we do like these. For one thing, they offer a much cheaper alternative to the Nura. At $229, they are an affordable way to get a look at the technology without committing a staggering amount of money. The Nuraphone is the company’s only offering right now, but if you want the best pair of wireless headphones currently on the market, we recommend the Sony WH-1000XM2. Thirty hours of battery life? Noise-canceling? AptX Bluetooth? Check, check, and check. They don’t have personalization but in this case you don’t need it. 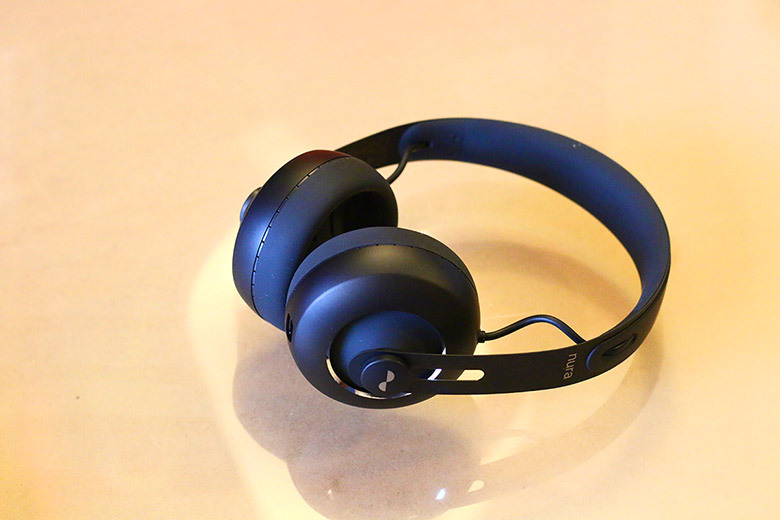 These are excellent, and well worth the $348 they cost - compared to the Nuraphone’s $400. There is a lot to love about the Nuraphone. The company very clearly wants you to have an absolutely mindblowing experience. The app, the case, the overall build quality…all of it is geared towards making you feel good. And the personalization does deliver, creating a pair of headphones that sound excellent. Unlike so many other poorly conceived Kickstarter products, these are the real deal. But again: we just can’t get away from the impression that things aren’t quite right here. The personalization comes with too many questions, too many strange artefacts and aspects, to make it the revelatory experience that Nura clearly wanted to be. And there’s the nagging sense that the company is just way, way too excited about the technology available to them, and that this resulted in them throwing absolutely everything they could at the cans, regardless of whether it was ready for public consumption. Should you buy these? There’s no doubt that they are an excellent pair of wireless headphones, and an easy addition to our Best Wireless Headphones list the next time we update it. But do not be taken in by the hype. Do not buy the marketing copy. These are very good, but they are not quite the quantum leap forward that the manufacturers want you to believe it is. However: want to go on record that when version two comes along, when the manufacturers have had a chance to test this thing in the real world and make changes, we will be the first in line.